From within the ice cream cone-shaped asteroid ship of the Triceratons, the Captain invites the Fugitoid to the command deck so that he can get a front row view of the Triceraton Homeworld: another cone-shaped asteroid base only immensely larger than the already-huge asteroid ships. The Captain then has Commander Mozar take the Fugitoid via airship to the High Council Chamber. Meanwhile, back at Tribase One, the Triceraton forces inspect the ship used to nab the Fugitoid and, within the cargo hold, find all four Ninja Turtles locked in some sort of low-respiratory meditation trance. Assuming them to be oxygen-breathers, they fit them with atmosphere converters. In the Council Chamber, Prime Leader Zanramon is having difficulty “softly” convincing Professor Honeycutt (the Fugitoid) to build the transmat. As negotiations begin to go south, a Triceraton sergeant contacts Zanramon, informing him that he’s taken the Turtles into custody. Seeing this as a bargaining chip, Zanramon orders the sergeant to place the Turtles in maximum security detainment, but not to harm them in any way. The Turtles put up a struggle, but are eventually crammed into a small holding cell. Honeycutt is taken away to a more luxurious holding cell, where he struggles with the realization that to save countless lives from the potential damage the transmat could do, he’ll have to sacrifice his own life as well as those of his friends if worse comes to worse. Back on Earth, April returns home to the Second Time Around shop, hoping to find the Turtles. Unfortunately, as with the past two days, they are still missing. Trying to take her mind off her worries, April switches on the TV and is greeted by a news bulletin. It has been two days since a beam of light shot from the roof of the Techno-Cosmic Research Institute (T.C.R.I.) and the owners of the building have sealed off all entrances and refused to let authorities in. April realizes that that’s where the Turtles said they were heading two nights ago. She wants to help, but realizing she’s powerless to do anything, curls up in a fetal position and cries. Back on the Triceraton Homeworld, at the Tri-Sports Arena, hosts Raz Charkov and Zed Lakin greet the audience to the night’s gladiatorial games, featuring four new off-world contenders. Prime Leader Zanramon opens the proceedings and the games begin. Several events transpire: the Gronks battle a Spasmasaur, the Mismatch Combat sees two oddball opponents go at it and the All-Out Gang War pits the Trogs against the Noids. As the final event approaches, Zanramon has Honeycutt brought to his booth. He asks him to observe the event: the Triceraton All-Stars (Mixx Trolo, Xoite Damaz, Daz Ublem and Monza Ram) vs. the Teenage Mutant Ninja Turtles! Honeycutt protests, but Zanramon insists that he’ll call off the event if he’ll concede to building the transmat. Honeycutt refuses and so the games proceed. Down in the arena, the Turtles have had about all they can take of being pushed around. 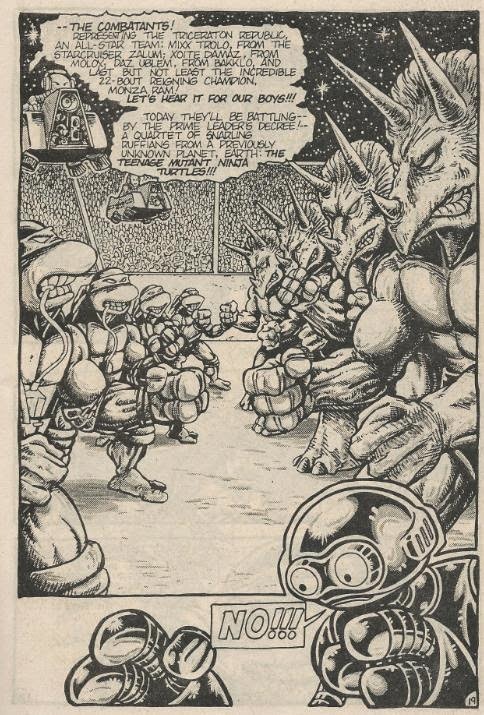 Leo gives a rousing speech and the Turtles leap into action against the All-Stars. The brawl drags on, with the Triceratons’ size and bulk giving them the advantage in durability. Regardless, Leo is the first to take his opponent down. Raph follows next, gutting his adversary while Don takes the jagged end of his broken bo and ends his enemy. As Mike takes his opponent out with a nunchaku blow to the head, Leo and Don notice Honeycutt in Zanranmon’s booth. Leo gets a boost from Mike and high-jacks a floating aircar filming the games. The other Turtles pile in and they take off toward Zanramon’s booth. Honeycutt keeps the guards from hitting his friends and the Turtles bail-out just as the ship crashes. Leo takes Zanramon hostage and the cowardly Prime Leader calls his guards off. Seizing several guns, the Turtles force Zanramon to take them and the Fugitoid to transportation off the Homeworld. As the Turtles head to Zanramon’s private ship, General Zath positions snipers within the hangar to ambush them. Unfortunately for Zanramon, when the guards spring the trap, the only thing they hit is him. The Triceratons quickly surround the Turtles and Honeycutt and prepare to execute them. Suddenly, a beam of light envelops them all and they vanish. *This story follows TMNT (Vol. 1) #5. The story continues in TMNT (Vol. 1) #7. 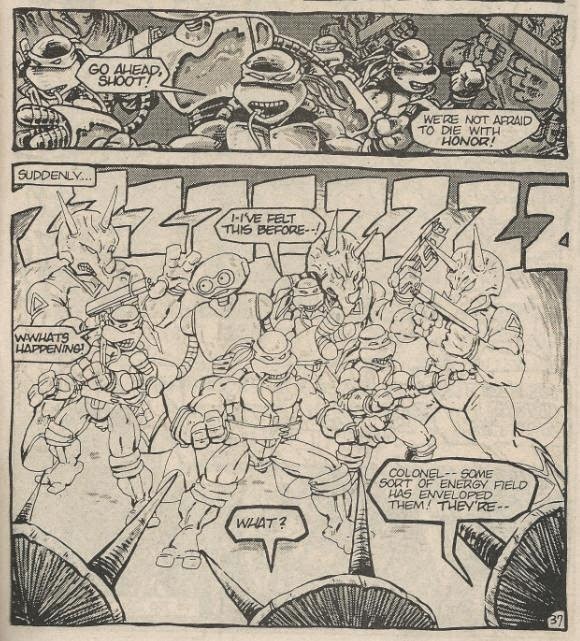 *The Turtles’s gladiatorial battle will leave them quite a legacy among the Triceraton people, as seen in TMNT (Vol. 4) #28. *A unit of Triceratons, dispatched to follow the transmat signal to Earth, will appear in TMNT (Vol. 2) #12. *The first printing of this issue also featured a bonus pin-up by Jeff Gaither and Willie Peppers, and a Prime Slime Tales back-up story, “Zigbone the Cat in Catatronic Dreams”. 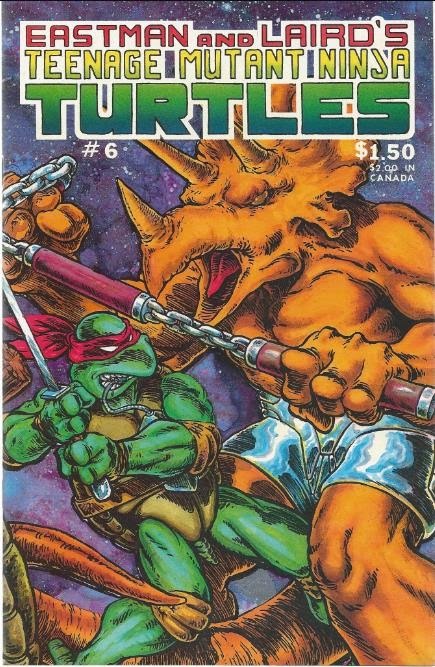 *The second printing of this issue (April/May, 1988) featured a new cover by Kevin Eastman, Eric Talbot and Steve Lavigne, a new back-up strip, “It’s a Gas”, by Eric Talbot, and two pin-ups by J. Horvath. Incidentally, the indicia mistakenly lists the issue as being published in 1987, rather than 1988, and many listings you'll find online did not correct this. *CHET ALERT: The name “Chester” can be seen on a building on page 14. “Chet/Chester” was an Easter Egg dropped into many Turtle comics by the Mirage staff because… they just liked that name! But silly in a good way, I’ll admit. The whole, “Taken by the enemy and forced to fight in their gladiatorial games” thing has been a cliché of cartoons and comics for decades, even when this book was published, so I can’t really give Eastman and Laird points for originality. However, I will concede that all the sports coverage parodying was amusing and I rather liked all the banter between the two announcers. The Triceratons are almost always portrayed as a warlike race of monstrous lunatics, so seeing some more laid-back members with a sense of humor is a refreshing change from the norm. This offers a very rare chance to see some non-military Triceratons. Enjoy it; you won’t see many more anywhere else in the series. I was pleased that they took a few pages to check back on April on Earth, as well as the fallout from the transmat going off at the T.C.R.I. building and how local authorities would naturally respond to such events. Even though the narrative has been Earth-free for only two issues, it feels like so much more for some reason. My gripe, however, is April rolling over into an emotional wreck. I understand that April really couldn’t do much of anything from her position, but when all we see of her in two issues is a blubbering worrywart, you don’t really get much of a likeable vibe from her. TMNT (Vol. 1) wasn’t all that hot with strong female characters, and even April didn’t really come into her own as a decent character until the “City at War” arc. She offers little in these early issues besides free housing and just comes across as next-to-useless. Seeing her ball-up into a fetal position and start weeping is sort of rubbing it in our faces. Dare I say, but allowing April to actually do something productive instead of having an emotional breakdown was about the only improvement in the 4Kids cartoon’s adaptation of this story arc. You can argue that Mirage's route gives the story more “emotional depth” if you want, but when the only female character in the book is a panicky do-nothing that faces adversity by crying in a balled-up position on the floor, I think I’ll take anything else over that. TMNT #6 is a quick read thanks in large part to the extended, nearly dialogue-less fight sequence against the Triceraton All-Stars. It goes on for the better part of 10 pages, and while exciting, zips by very fast. I especially liked Mikey’s foe, though, with the, uh, three… tubed… nunchaku? Yeah, I’m no martial artist, sorry. As I mentioned last issue, here we get to see early-Donatello with a grittier killer instinct than his later portrayal, as he slays his enemy with the broken end of his bo. His victory cry, “FOR HONOR--!” reminded me too much of that nonsequitor he yelled in the second episode of the Fred Wolf cartoon after destroying a robot, “TURTLES FIGHT WITH HONOR--!” Not really a good thing, mind you. But to keep from being too negative, I will admit that I got kind of a thrill when the announcers introduced the guys as the “Teenage Mutant Ninja Turtles!” in big bold text, though. Kind of reminded me of the wrestling scene from the first "Spider-Man" film where Bruce Campbell introduces Peter as "The Amaaaaaazing Spider-Man!" Overall, the plot of this issue is as text book as they come, but it facilitates some well-done fight sequences. 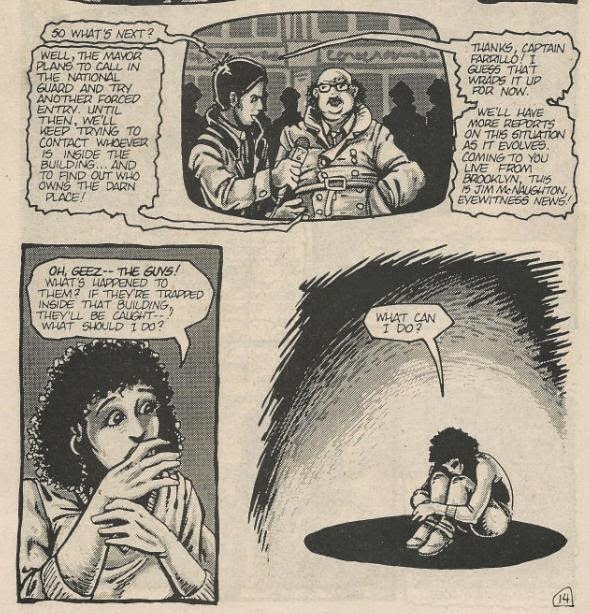 Conversely, the glimpse back at the events transpiring on Earth felt long overdue, but the portrayal of April as a simpering sadsack can be kind of irksome. All in all, TMNT #6 kind of leaves you with a feeling of “Thanks, but no thanks”. Tough grade, D+? Its a FANTASTIC fight sequence. Its got to be worth a strong C just for that! No?